The end of the year, when your customers are busy with their holiday fun and hopefully their HVAC systems are in top condition, is the perfect time to look back on the last twelve months—and ahead to the new year. What changes are coming? 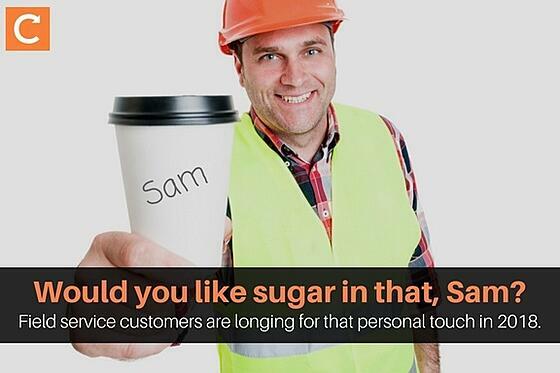 What will your customers be looking for? What new technologies will be cropping up that will make your field service business even more efficient? It can get overwhelming, though: The pressure to research the industry, check out the competition, and plan your entire year right-now-before-it's-too-late!! is intense. Relax. We did all the research for you, so sit back and keep reading to discover the top field service trends that will affect your business in 2018. No pressure to put everything into place before the clock ticks over to midnight on December 31. Let the competition scramble to turn their business upside down while you take the time to think about how you'll get it done right. The future is here (and it's all good). We're not trying to scare you with a "welcome your new robot overlords" vibe, but in the coming year we'll be seeing more and more automation. Field service engineers will be tossing their paper diaries and office staff will be making the first steps toward a paperless office through software and apps that automate scheduling, invoicing, service reminders, and more. What about augmented reality? Since Pokémon GO made a hit in 2016, we're starting to realise that AR can help us do more than find a Charmander at the local skate park—it can also let field service businesses diagnose problems from afar, and even make repairs more quickly as remote experts guide engineers in the field using wearable technology like this. Augmented reality hasn't caught on in field service in a big way yet, but we’re seeing a lot of research building a compelling case for the technology—so maybe in 2018 we'll start seeing engineers wearing funky AR glasses as they go about their work. Then there's the Internet of Things (IoT), where devices, vehicles, home appliances, machine components, and more are connected to each other or to the internet. The analyst firm Gartner says there will be over 26 billion connected devices by 2020, and that 'In 2018, IT organizations will continue to receive pressure from business units and operational technology groups to support a variety of IoT-enabled solutions'. We get that you're not an IT organisation, but the same holds true for you: As more appliances and installations become connected, you'll need to learn how to work with this new technology and how to make it work for you. For example, Capterra discusses changing service contracts to reflect the fact that you'll now know when equipment is about to break down. MORE READING: Want to automate more of your business? Read about why job management software is your business's best asset. Business is softer (but in a good way). Your customers expect you to fix their broken plumbing, install new boilers, or complete their building projects—and they expect you to do it well. That's a given for every field service business, so you won't get far just by being proficient (or even the best) at what you do. What your customers are really longing for in 2018 is excellent customer service, personalisation, and just plain nice experiences, according to SCORE. So while you do want to be on top of the newest technologies, the best parts and supplies, and frequent skills training, in the coming year you'll also want to focus on the customer experience. Putting a focus on customer service in 2018 will propel you past competitors that are only good at their jobs. 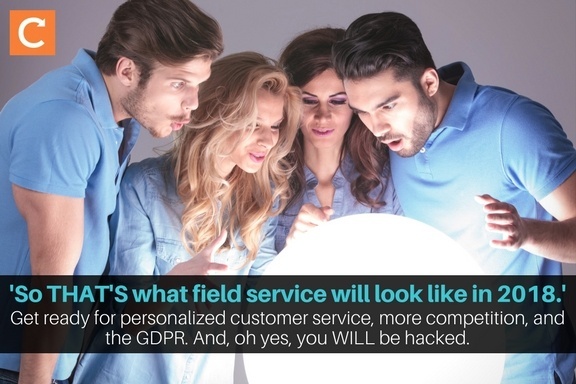 The GDPR is looming (but you can be ready). How you collect, store, and protect data. How you ask for consent before you collect sensitive information. When you need to inform customers of data breaches. Not to mention, the British Assessment Bureau warns that 'You will be hacked' in 2018, since cybercriminals see SMEs as easier targets than big businesses. This makes compliance with the GDPR even more important, but don't worry: In January 2018 we'll have an entire post about the GDPR, plus a thorough checklist and guide that will help you prepare for the change. If you subscribe to Commusoft's newsletter now, you'll get the checklist/guide as soon as it's available. The competition is fiercer (but you can beat them). Thanks to the internet, it's easy to set up a business these days: Create a website, start building your thought leader cred on social media, and voilà! You're in business. That's why the British Assessment Bureau says, 'One of the biggest challenges SMEs will face in 2018 is growing competition'. The solution that will keep you ahead of the growing pack is to figure out what your competitive advantage is and to make sure that your customers know what it is, too. As you saw earlier, soft skills will be a big deal in 2018, so if it seems you can't compete on deliverables—and you don't want to compete on price—you can make customer experience your competitive advantage. MORE READING: Blast the competition out of the virtual water with these seven tips for converting more quotes into jobs. Health and happiness are 'in' (and we can help you). As the saying goes, if you don't have your health, you have nothing. Health trends for 2018 include intermittent fasting, sleep optimisation, and gut health. Workplace wellness will also be a priority in the coming year as we discover how stress and burnout affect employees, and in turn how they affect our businesses. We at Commusoft want you to be happy, so we put together a case study of Thaw Out Heating & Plumbing. Thaw Out's owner has been so thrilled with our field service management solutions that we asked him to tell his story in his own words. Just click on the banner below to get your free download and find out how happy you can be in 2018.